The best chicken I’ve ever eaten was in Costa Rica. I lived in a tiny town called La Esperanza (literally translated as Hope) in the mountains of Costa Rica for a year. I taught English in the public elementary school and spent many afternoons walking the steep, dusty roads to share food with new friends. My visits to Costa Rican families centered around food. Since these families didn’t have a lot of money and primarily survived on subsistence agriculture, meat was a luxury they cooked for guests. And it was delicious! In La Esperanza most families seemed to have a flock of chickens. I would often see a mother hen clucking protectively, gathering her flock of multi-colored chicks. These chickens were good mothers and perpetuated the flock, in spite of the iguanas and other predators that snatched some of the chicks. Though people would feed these chickens handfuls of corn thrown in the dirt, much of what the chickens ate was foraged. When my host mother wanted to cook chicken for dinner, she would send my host brother or sister outside to catch one of the hens or roosters that wandered around outside the house. Lili or Pelon would chase the flock until they caught one, then carry it by its feet into the kitchen, where Heidi had a pot of hot water on the stove. Heidi would hold the chicken close to her body, head down, and pull on the chicken’s head until she broke its neck. She then dipped the chicken in the boiling water and sent it back outside with Lili or Pelon to pluck the feathers. Then Heidi would cook the chicken and serve it for dinner. It was the ultimate in fresh, free range meat, and had so much more flavor than anything I’ve bought in a store or restaurant in this country. Costa Rica cemented my transition from vegetarian to omnivore. Andy, too, eats meat now after many years as a vegetarian. We like to eat meat, though we do try to eat mostly meat from animals that were raised in a humane and sustainable way. We like animals, and we want them to be happy before we eat them. We also believe happy animals with a varied diet produce tastier and healthier meat. We like free range meat, and we want it to be a part of the wedding dinner. So we decided to raise our own chickens. 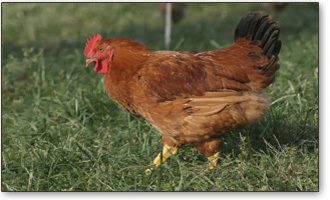 Cornish Cross chickens are the most commonly used meat hybrid. I’ve eaten these birds, and they taste good. We’ve seen these fat white birds grow quickly to slaughter size. There is an obvious advantage to a bird you only have to feed for six or eight weeks instead of 10 to 12. But we’re turned off by these chickens for several reasons. They seem over-bred to us, to the point of sacrificing some beneficial traits. They don’t seem to forage well, and some crosses have trouble even standing and walking because they grow too fast for their legs to keep up. We wonder if flavor could be better in a bird that eats a more varied diet and wasn’t bred primarily to grow fast. This isn’t to say that raising Cornish Cross birds is a bad choice, but we decided to look for an alternative. In doing some research on Cornish Cross birds, I found the following excerpt from an article published in “Grit!,” the newsletter of American Pastured Poultry Producers Association (APPPA) and included in APPPA’S compilation: “Raising Poultry on Pasture: Ten Years of Success.” The article was written by Harvey and Ellen Ussery and can be found at http://www.TheModernHomestead.US. Looking for an alternative, we found positive reviews of Freedom Ranger chickens as meat birds. Another few clicks with the mouse and we had ordered 50 from J.M. Hatchery in Pennsylvania. They’ll be shipped as day old chicks on June 30, and we should receive them two days later. We’ll keep them in the garage for a few weeks under a heat lamp, and then we’ll put them in a moveable chicken tractor so we can rotate them around the field near our garden. This way they’ll always have fresh grass and bugs to feed on. We’ve made an appointment to have them slaughtered September 18 at West Gardiner Beef. Then we’ll keep them on ice until we roast at least 25 of them for the wedding. The rest we’ll probably stick in our freezer and/or sell to friends. We look forward to watching these birds grow outdoors with plenty of food, water, shade and sun. We also look forward to eating the juicy, tender, flavorful meat. Let’s just hope our structure is sturdy enough to keep out the predators!